Please call Right to Life of Missouri at (573) 635-5110, and express your outrage that its PAC would endorse someone who espouses Jew-hatred and bigotry. Ask whether or not it’s pro-life to support Islamic terrorism and bus bombings. 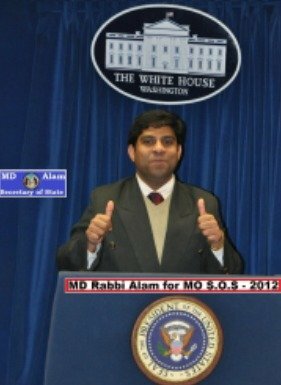 Tell the Right to Life people that you hope, given the information that’s come to light on MD Rabbi Alam, that Right to Life will rescind its endorsement of him, lest it be known as an organization that acquiesces to Jew hatred and the promotion of Islamic terrorism, issues that take away from its pro-life mission. 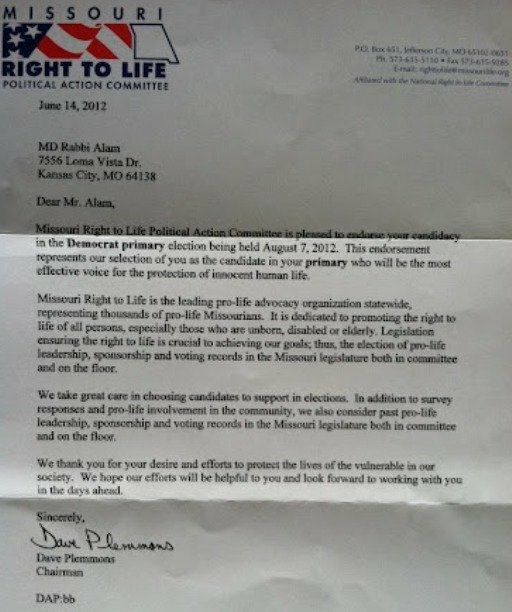 Please also email Dave Plemmons, the Right to Life Missouri PAC official who made the endorsement, with the same message about their endorsement of MD Rabbi Alam. It’s very important. Please make the phone call and send the e-mail message. I sent one and am awaiting a reply. But the more people that contact him about this unfortunate situation, the better. It’s amazing that RTL would endorse this muslim creep who supports terrorism and bigotry unless perhaps they have some Jew-haters on their leadership. Thanks for posting this whole Alam story, Debbie. More likely I’ll either send them an email or I’ll contact them by telephone. And since I’m on facebook (with 64 friends and counting) who follows DS and other folks I like, I will be forwarding this link onto my FB wall-page so all of my friends can see and read this and I’ll tell them to contact RTL-Missouri and tell them that their dead wrong on endorsing such a wingnut freak like MD Rabbi Alam for Missouri Secretary of State! When I first read the article on this I called Patricia Skain, Executive Director and asked her if she knew anything about the Muslim Brotherhood, Shariah/Islamic law and our history with those that are trying to force the entire world to be within their Caliphate. I suggest each of us call her and e-mail facts to her so she will understand the challenges we are all facing. Keep in mind, Shariah/Islamic law is traveling on the same flying carpet as those individuals and groups intent on destroying America. The flying carpet is called cultural Marxism or more commonly called political correctness. Go online and read: Communist Goals – 1963 Congressional Record and see how many of the 45 goals have been attained and how close they are to completing the others. Cultural Marxism or more commonly known as political correctness is the flying carpet upon which Shariah, communists, Marxist, Leftwing, socialist, radical, Democrat Party and new RINO Republican Party travels today along with their public relations group, main stream media (print, radio, TV and Internet) is helping them. If you want to know what is going to destroy America it is Political Correctness which is Cultural Marxism. I was once a candidate for State Representative in Missouri. They send a questionnaire to every candidate. If the candidate answers the questions correctly and there isn’t an incumbent that already has RTL endorsement, you then get their endorsement. They don’t do a background check beyond the questionnaire. In an extreme case like this I’m sure they will pull their endorsement. I hope they pull their endorsement! This is not the kind of candidate any decent American would want to back. Any one who is agnostic on the question of Americans being mass-murdered by Islamic terrorists on 9/11 and who believes Jews like Alisa Flatow deserve to be murdered by the same creeps, which are the position Rabbi Alam takes, is NOT pro-life! Getting the RTL Committee to withdraw its endorsement helps. And we need to make others, like the Sikhs aware of his extremist views. He can hide them from Democrats and fellow Americans. Debbie Schlussel’s work ensures he can’t whitewash them and fool Americans into thinking there is such a creature as a “moderate” Muslim. No such animal. Debbie, keep up the good work and G-d bless ya! Are we supposed to think he’s a doctor and a rabbi??? Of course they should absolutely withdraw their endorsement! !